Bunzl Catering Supplies has added the reCUP™ from supplier Cup Print to its portfolio of sustainable paper cup options. Made with an innovative barrier coating for paper cups called EarthCoating™, the reCUP uses 48 per cent less plastic than a standard PE lined paper cup and is fully recyclable when disposed of in a dedicated paper cup waste stream. Manufactured in Ireland, reCUP is available from Bunzl Catering Supplies as an attractive off-the-shelf option, a Kraft design with the words ‘great taste less waste’ presented on one side and ‘coffee is always a good idea’ presented on the other. Available as a double wall hot cup in sizes 8oz, 12oz and 16oz and packed in cases of 500, the reCUP can also be custom printed subject to volume requirements. Standard PE lined paper hot cups are also recyclable if dealt with in the right way at their end of life. 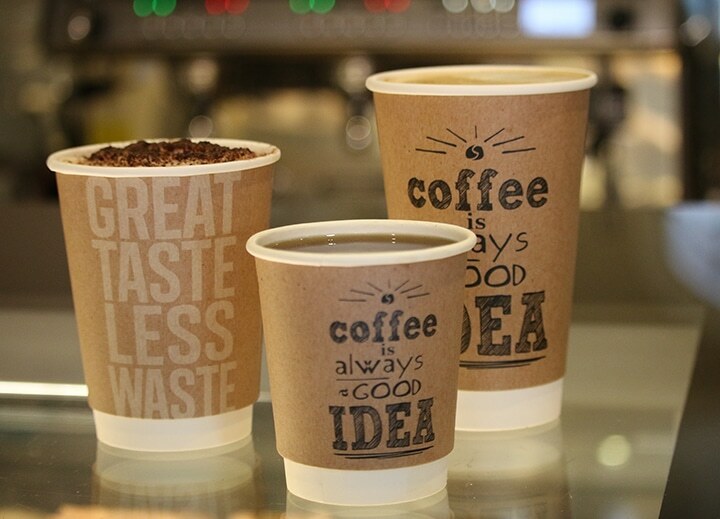 There are specialist recycling facilities in the UK which accept used hot cups for recycling. A unique scheme called Simply Cups currently operates a credible collection and recycling service for hot cups, funded by an annual membership fee, where the cups are sent directly to these specialist facilities. In October 2017, Bunzl Catering Supplies, collaborated with 13 other fully funding signatories from across the supply chain for disposable paper cups, to sign an agreement with the Alliance for Beverage Cartons and the Environment (ACE UK) to increase PE lined paper cup recycling. Over two stages, this initiative will offer consumers access to a network of Bring Banks to recycle their used paper cups, and crucially provide the right incentives and access for all waste contractors to deliver paper cups to the ACE facility. This new partnership will introduce a more widely accessible recycling infrastructure, enabling consumers the opportunity to dispose of their cups responsibly. For more information about the reCUP and PE lined paper cup recycling please contact us today.